It's time for another Tutorial! Anyway, so I decided that I need to blog about each of the projects, mostly so I could keep notes on my classes in case I teach it again, but also so the kids could come here and refresh their memories on what we did. Note: Most of this tutorial shows the prep work I did before the class. The kids only decorated the badges. 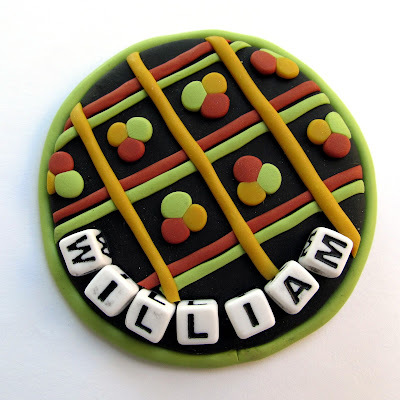 These first few steps are instructions for making a tray for baking your badge on that will keep it flat in the oven. Cut two squares of cardboard a little bigger than your big circle cutter. Cut a piece of parchment paper big enough to wrap around the cardboard and glue it on. Put the pin back on the parchment (relatively near where the top will be) and mark the ends of the pin. Cut holes for the ends of the pin back. Cut a slit between the holes and stick the pin in there to test the size and placement of the holes. Make them bigger if needed. Roll out a thick sheet of black clay and one of mud (or more black if you don't have mud). Set the black aside and lay the mud on the work surface. Make a cut across the top third of the sheet in a straight line. Press the pin back into the clay, centered on the cut, to leave an impression, then remove and set aside. Use a tiny circle cutter to cut holes where the ends of the pin will lie. It's okay if they are a little small. Remove the top third of the sheet. Slide the base of the pin back under the edge of the larger piece of clay, lining up the ends with the holes. Replace the first piece of clay, lining up the holes. Carefully lift the sheet of clay with the pin in it and turn it over on your makeshift tray, lining up the pin with the holes, and pressing it in. Lay the sheet of black on top of the mud. Roll over it with the roller to compress, smooth, and force out any air bubbles. You can poke any stubborn bubbles with a needle tool and then smooth. Cut with the circle cutter. Make sure that the pin is in the upper part of the circle. Smooth the cut edge with your fingers. Press letter beads into the clay. 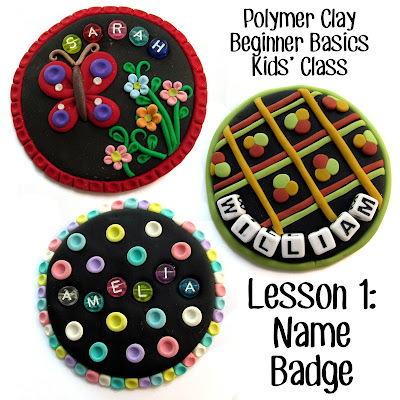 Make basic shapes out of the colored clays to make a design. Use snakes, strings, balls, teardrops, etc. Add a border and bake according to your clay manufacturer's directions. Wait until your badge is cool before you pull the pin out of the holes in the cardboard.